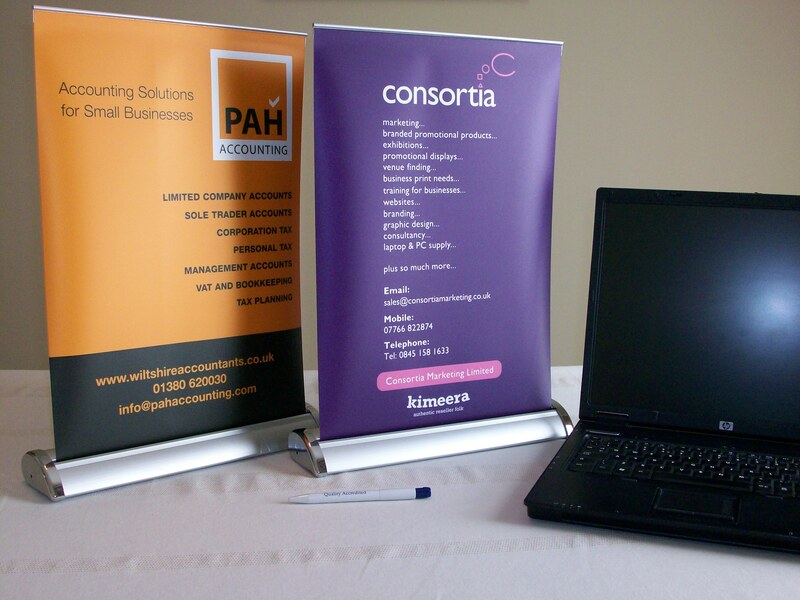 These A3 portrait desktop roller banners are proving very popular! Very easy to transport when collapsed into the metal cassette case (they will fit in a laptop bag or briefcase, for example), and unrolled in seconds! From only £48 +vat they are a bargain way to promote your brand and company to attract customers and clients! OUR HOTTEST PRODUCT OF THE MOMENT!! BUY YOURS NOW. There’s mine on the left! After chatting to Eric about this product he sourced one for me, got the artwork dealt with and delivered promptly. The roller banners themselves really are great quality and very durable. They are ideal for the regular networker. Rather than carrying a large banner around taking a whole heap of car boot space these really stand out on any ‘bumf’ table and can fit into a small laptop bag. I was absolutely delighted with the product and the service given. Really top drawer. Many thanks for your feedback Phil. Glad you like the Desktop Banner – It’s pretty striking when on display isn’t it! These banners are great! It’s time mine was in the photo! I’ll have to grab a photo of yours when it’s on display at your next networking meeting Roland! I know you’re very proud of it!